Tom McDonald Contracting has been in the asphalt paving business since 1990, serving Lewes Beach, Delaware customers. 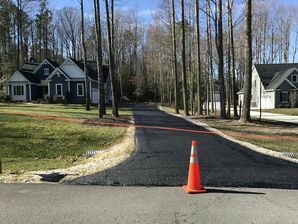 Our comprehensive range of Lewes Beach residential and commercial paving services includes: new driveways, temporary roads and temporary driveways for properties under construction, parking lots, and walkways. We also repair Lewes Beach driveways, Lewes Beach parking lots, and Lewes Beach roads, including potholes. If your Lewes Beach driveway needs asphalt patching, repair, or crack sealing, we can handle that too. Tom McDonald Contracting also offers asphalt sealcoating for both Lewes Beach residential and Lewes Beach commercial asphalt surfaces. Call (302) 219-7939 for your Lewes Beach, Delaware residential or commercial Lewes Beach paving needs. Tom McDonald Contracting has been paving Lewes Beach driveways and Lewes Beach parking lots for 29 years. Call (302) 219-7939 to speak to one of our Lewes Beach asphalt paving specialists. Tom McDonald Contracting has a Lewes Beach excavation crew that will get rid of your old asphalt and base material then install a properly compacted gravel base to ensure proper water runoff. Our fleet of various sizes of vibratory rollers can handle any size job to make sure your Lewes Beach black top surface is as smooth as possible. Tom McDonald Contracting has been in the asphalt business for 29 years, smoothing the way for Lewes Beach driveways like yours. Over time, traffic and weather will break down your asphalt surface. For asphalt surfaces in Lewes Beach that are still in good shape but need repair, we shim out any low areas and then overlay the entire area with new asphalt. We can handle big bumps like potholes. We can handle small bumps like cracks. Whatever kind of Lewes Beach asphalt resurfacing you need, Tom McDonald Contracting can handle the job for you with the right application for your Lewes Beach asphalt surface. To keep your asphalt surface looking great, Tom McDonald Contracting recommends seal coating your Lewes Beach asphalt surface every 4-5 years. Make your asphalt safe and attractive. Call (302) 219-7939 for a free estimate for your Lewes Beach residential or Lewes Beach commercial paving project. We acquire any necessary permits. We ensure that your surface is properly prepared for asphalt application. We take care not to damage surrounding landscaping. We leave your site clean. Our professional Lewes Beach asphalt paving crew will provide a smooth surface that will look great and hold up for years to come.